The property features 1,232 ultra-luxury hotel condominium suites and 50 exclusive penthouse suites, white-gloved doormen, valet parking and 24-hour concierge service. 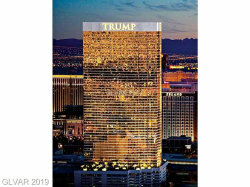 It’s amenities include a sumptuous day spa, fitness center, salon, acclaimed restaurants, DJT® and H2Eau™, an outdoor heated pool and sundeck, as well as a full-service business center. The experience at Trump International Hotel Las Vegas is at a level of excellence that is undeniably Trump. 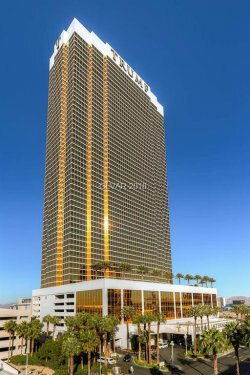 Perfectly sized, these elegant studio condominiums display what has become the hallmark of Trump International Hotel Las Vegas – magnificent views of the City, the Strip and the mountains, framed through floor to ceiling windows. Enter into a glamorous living space with elegant crown moldings, a luxurious king sized bed, custom cabinetry and a state-of-the-art kitchenette which allows you to indulge any time, day or night. Beautiful Breccia Onniciata marble encapsulates the bathroom complete with double sink vanity, 6 foot whirlpool tub, and your own personal TV, custom installed in your bathroom’s mirror. 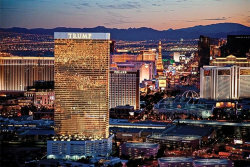 The Studios at Trump International are truly one-of-a-kind Las Vegas Condominiums and your key to a spectacular lifestyle. 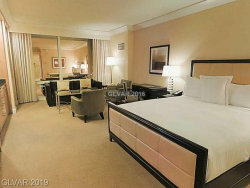 For the person wanting to live the true Vegas lifestyle, the One Bedroom Corner is the perfect suite. With exceptional, multidirectional floor-to-ceiling views, a lavish bathroom, full-size Sub-Zero refrigerator and LG plasma screen televisions, this one bedroom condominium is the home that you will love to flaunt. Enjoy spectacular views from your whirlpool tub, cook a sumptuous meal in your expansive kitchen, and indulge in your luxurious king sized bed – no detail has been overlooked in this Las Vegas Condominium. Located on the highest floors and containing the most magnificent views of the Strip and surrounding skyline, these expansive one bedroom Las Vegas penthouses take luxury to new levels. From the time you step through the grand double doors into the over-sized living room, you are struck by a beautifully designed custom entertainment system with a 50 inch LG plasma TV and hand-worked cabinetry. The dining room and full size kitchen equipped with the finest Sub-Zero, Bosch and Wolf appliances, make this the ideal penthouse for even the most meticulous entertainer. While the one bedroom penthouse is the perfect unit for entertaining, features such as the lavish walk-in closet and fabulous master bath with elegant marble baseboards, his and her custom vanities, 6 foot whirlpool tub and glass enclosed dual headed shower, make it a superb place for privacy and solitude. 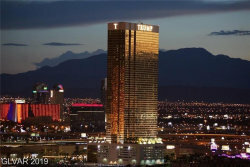 This penthouse is the ideal combination of Trump exclusivity and Las Vegas extravagance. For the sophisticated owner that likes to lavish their house guests with expansive space, this magnificent two bedroom Las Vegas penthouse is a spectacular choice. Guests will be awe-struck as they enter through the grand double doors leading into a beautifully designed living room with unparalleled views of Las Vegas. Equally impressive, the state-of-the-art private kitchen and breakfast bar provide the ideal respite to a night out on the famous Strip. 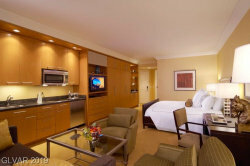 While guests enjoy their fantastic surroundings, the tranquility of the Master Bedroom provides the perfect hideaway. 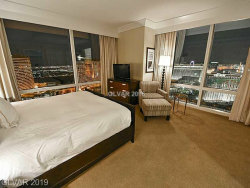 Complete with an expansive walk-in closet and king sized bed and complemented by the finest bathroom in Las Vegas, the two bedroom penthouse is the ultimate in modern luxury. 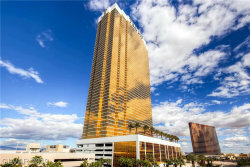 Impeccably designed, the three bedroom penthouse is the pinnacle of opulence and luxury in Las Vegas. Open dramatic double doors onto your exclusive Breccia Onniciata foyer and you will be directed to spectacular 10 foot floor-to-ceiling windows featuring breathtaking panoramic views of Las Vegas. Unwind in the expansive living room boasting supple couches and a custom-built entertainment center. Entertain extravagantly in the dining room adorned with custom chandeliers and spoil yourself in the state-of the-art kitchen, featuring Subzero, Wolf and Bosch appliances. Enjoy peaceful moments in the magnificent master bedroom designed specially with unique details including gorgeous custom furnishings, his and her walk-in closets, and a decadently dressed king sized bed. In the master bathroom, Italian marble vanities, a 6 foot whirlpool tub, bidet, triple headed shower and his and her commodes will provide the ultimate indulgence. Pamper your guests on the other side of your grand penthouse in two exclusive, graciously appointed bedrooms featuring king sized beds, LG plasma screen TVs and lavish private bathrooms. Superb in every detail, this Las Vegas penthouse is designed for true royalty.